1. 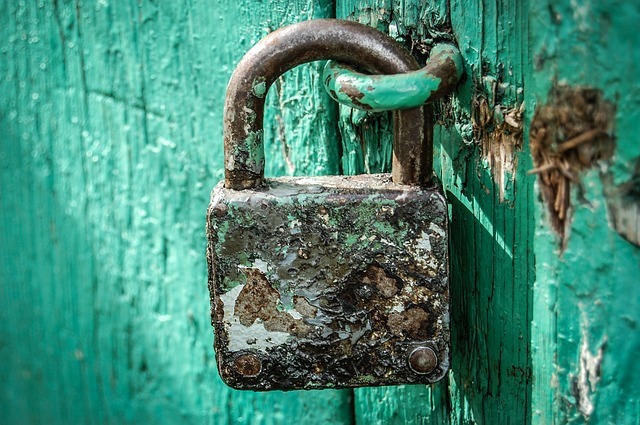 Openly accessible articles are cited earlier and more frequently than those behind paywalls. Pretty straightforward. If everyone can find and read your work then you would expect this to be the case. Paywalled articles can only be read by researchers who have access through their institution. This excludes large numbers of workers, and especially those from developing nations. 2. Converting your data, code, presentations, notebooks and reference libraries into extra research outputs means you get more credit for the work you’ve already done while helping other workers to reproduce or build on your work (and you potentially receive even more citations). Whether its uploading presentations to figshare, throwing your code on Github, or even uploading pre-prints to your chosen pre-print server, these extra outputs can be proudly displayed on your website or CV. For PhD students in particular, this is a great way to demonstrate the quality of your work while it is going through the publishing process. And lets not forget the power of altmetrics: Any effort you put in to increasing your research exposure is an asset to your career, even if you’re not interested in academia at all. Getting your name out there and connecting with other people creates opportunities. 3. Your work can have broader societal impact when used by governments, NGOs, non-profits, citizen science initiatives, community groups, and everyday people. True, as a private citizen, you may have no personal interest in reading scholarly articles. But what about the many interested people that do? And what about the doctors/teachers/local government representatives in your area? Published research findings can be applied to professional development and evidence-based governance. We all benefit when decision-makers are more-informed and when professionals are better trained to deliver crucial public services. I don’t think it’s unreasonable to assume that most researchers do what they do in large part because they are curious about the world around them and they want to share the results they find with other like-minded people. 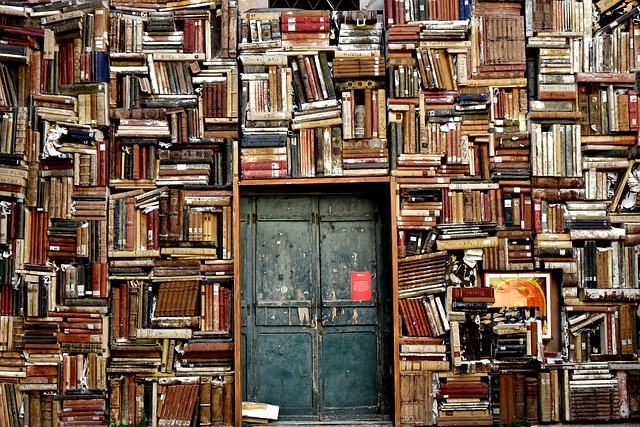 I think it’s important to remember that most research is behind a paywall because the authors are unaware of their right to self-archive their outputs, they don’t know how to do it, or they have too much on their plates already. So, everyone wins when we adopt open principles and communicate our work more effectively. How do I make my articles freely available? Deposit your post-print in your institutional repository (and make it open to the public). Self-archive the post-print on your personal website. Both of these approaches are called Green OA. Let’s break it down. Post-print: The version of your manuscript which has been through peer review and has had feedback incorporated, before the publisher typesets it. This is identical to the version of record minus the formatting. Self-archiving: The act of uploading a manuscript to a personal website or repository and making it available for download. 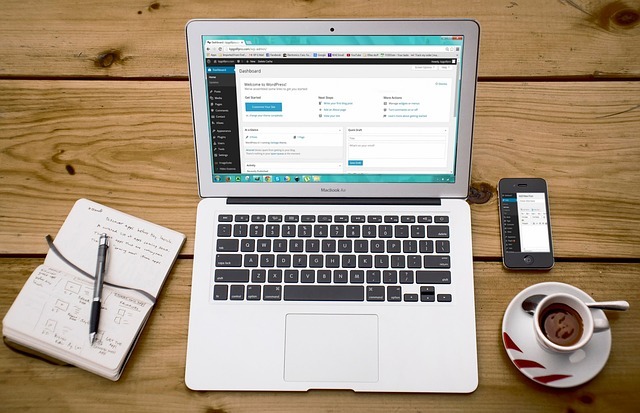 Personal website: I’ve written a guide for setting up a personal website on the WordPress.com platform in less than 10 minutes. If you pay USD$5/month you get a custom domain name, or you can use a free plan which has some restrictions attached (e.g. your domain name will be mydomain.wordpress.com, and WordPress will display some ads on your site). Luckily, all the big publishers allow self-archiving on personal websites (although even here there are sometimes embargoes such as the 6 month one required by Nature Publishing Group, but this is definitely not the norm). You can check policies for the journal on the SHERPA/RoMEO database, a searchable index of publisher and journal copyright policies including a simple summary of what you’re allowed to do with the post-print. I’ve never seen a journal that forbids self-archiving post-prints no matter what, but there may be a few. It’s also worth noting that some funders require you to deposit articles in publicly accessible databases after publication, so make sure the journal yo uare publishing in allows those requirements (or amend your copyright transfer agreement to retain certain rights – this opens up all sorts of possibilities). SHERPA/RoMEO shows the default copyright policies for academic publishers and notes whether there are any conditions attached to self-archiving (Elsevier is shown in this example). Here’s my favourite part: If you self-archive your post-print in a repository or a personal website then Google will index the pdf and link to it in Google Scholar search results. Usually it will achieve this within a couple of weeks of you self-archiving the text. This takes care of discoverability nicely: Google scholar is the search engine of choice for people looking for free journal articles. If someone is looking for free research which you’re providing, they will likely find your post-prints. Google scholar has indexed the post-print I uploaded to my personal website and is now displaying it alongside results for my species description published in NZ Entomologist. Below this, Google Scholar has helpfully retrieved a copy of my masters thesis from the university repository (where it is publicly available). Can’t I just email my paper to people who request it? Not sure about you, but I would conclude I can only email the full-text of my paper to colleagues if it was part of teaching or training at my institution, or a grant/thesis/doctorate. It turns out many journals do allow you to email the full-text out, but you’ll only find this in the copyright transfer agreement you sign as part of the publishing process. 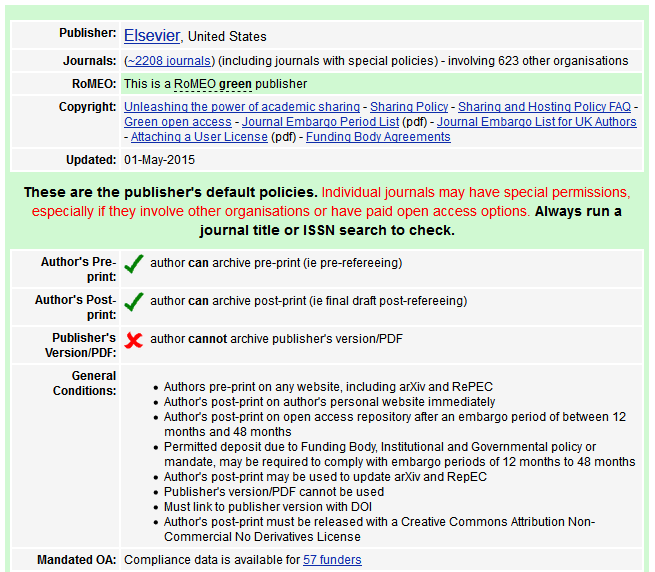 I’m still not sure why publishers have very different sharing policies to the journals they publish. Hopefully I’ve shown you how to make your work freely accessible without having to incur extra costs, or sacrifice your choice of journal. What are your thoughts? I’d love to hear what you think of this post. Are your lab members aware of the issues around copyright? Do they know they can self-archive? Why or why not would you consider doing this yourself? Please let me know in the comments. Excellent overview of how to open your work! 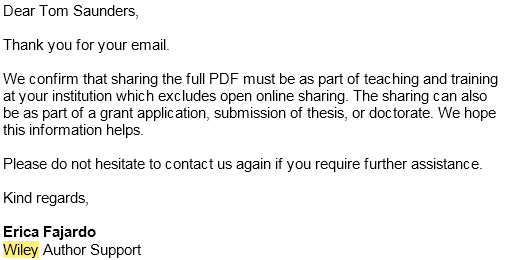 If your institution uses Symplectic Elements (as most in NZ do) you can upload your paper directly from there. Thanks so much Anton! I had a read of your most recent posts too and found them very relevant for where I’m at currently. I remember last year even talking to one of the library staff at my uni about institutional repo vs personal figshare vs institutional figshare haha. Cheers!